Acknowledged as a leader in the field of evolutionary digital design and the originator of the Evolutionary Digital Design Process. His book An Evolutionary Architecture is considered the seminal work in the field. Work embraces the domains of intelligent and interactive design systems, sustainable design, participatory and co-operative design and computer generated design. His pioneering research and teaching was nurtured at Cambridge University, the Architectural Association in London, the University of Ulster, the Hong Kong Polytechnic University and Queensland University of Technology. His work has been presented worldwide in lectures and conferences and extensively published in journals and books. He founded and directed award winning software company, Autographics, which in the late 70s developed and marketed the world’s first microcomputer based design systems and was amongst the pioneers in the use of computers in design education. He is also acknowledged as creator of the discipline of tangible interfaces with papers and patents from the late 70s onwards. 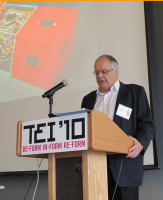 Recently honoured with giving the opening keynote at TEI 2010 in the new Media Lab at MIT in recognition of being the world pioneer in the field. This work on interactive and intelligent environments was applied In particular to the GENERATOR project with Cedric Price now in the permanent collection of the Museum of Modern Art (MOMA) in New York. Personal research focuses on generative and evolutionary computing for sustainable design, public participation in design and planning, and interactive design and tangible interfaces. Author of An Evolutionary Architecture (1995) which proposed a new model of the design process fundamentally realigning the roles of the user, the tool and the means of construction. The computer uses generative and evolutionary computing techniques to become the accelerator of the co-operative evolution of a sustainable future architecture and the means of prediction, exploration and evaluation of multiple possible future design trajectories. Menu photograph of John Frazer © Valerie Bennett with thanks for permission to use. More portraits of architects and writers can be found on Valerie's website where hi-res versions can be purchased.